America’s Top Twelve ArtPlaces 2013 | ArtPlace. ArtPlace, an organization offering grants and other support to communities that combine art, artists, and venues to encourage creativity and expression, has named the most vibrant art neighborhoods in America. Of the twelve, three are in California, the most of any state. The top ArtPlaces of the Golden West are Central Hollywood, The Mission District in San Francisco, and, surprising us a bit, downtown Oakland, encompassing Chinatown, Old Oakland, and Jack London Square. The neighborhoods were singled out for criteria including their walkability, for nurturing independent businesses, and for making art and artists a core part of the community. Downtown Oakland was singled out by the organization as the “true underdog” in the competition, but noted that the transformation that has taken place in the city over the last decade would have been unthinkable 15 years ago. What brought it about was a grassroots effort – Oakland Art Murmur – very unlike the high-minded but doomed postwar urban renewal plans. But the beat goes on, and a walk down Sunset Boulevard on any given night offers ample evidence – from Amoeba to the Roxy – that American music is as healthy as it has ever been. The problem remains a hidebound industry more interested in defending its business model than in the product itself. The slow, disreputable whittling down of the artists and repertoire (A&R) function within the major labels is testament to as much. The industry is in decline as a result, but we can already see, here in California, the foundations of a new music industry that is rising in its place. And all of this is taking place in a way that attracts tourists and neighborhood people alike. When I read about what’s happening in the Mission District, I kick myself for not going there when I was in San Francisco in December. Absorbed in the myriad culinary delights in Chinatown, the Financial District, and North Beach, I never thought to wander south of Market. I won’t make that mistake again. San Francisco is suffused with art, but ArtPlaces notes that the edgier, more affordable art can be found in The Mission, along with antiques, music, and some incredible eats. I won’t be missing it next trip. 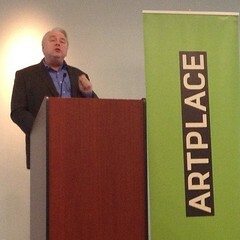 Take a look at the full report on the ArtPlaces site at artplaceamerica.org.